The fight for independence has been a common tale throughout the world in almost every way possible. Great changes in history have been dictated by those who wanted to rise up and drive out their oppressors. Almost every country in the world has their own Independence Day where the old rule was ousted in place of a new rule. It’s a history that still enraptures people to this day. With that in mind, it’s hardly a surprise that a common theme among video games is a revolution where you regularly play as the leader. It doesn’t matter if the game is a first-person shooter or a JRPG either. The theme is always the same. There is an overbearing power that is destroying the quality of life of those beneath it, and a small group always rises up for the inevitable takeover. The games typically start with you as person with limited resources and almost completely without power. Overtime, your power grows as you gather more allies and better resources. The small resistance group eventually becomes a veritable army without peer. I have played an incredible amount of games with this theme because it’s really the go-to story for many developers. In honor of July 4th however, the United States Independence Day, I want to talk about a personal favorite game of mine that is all about fighting for American freedom. This isn’t freedom from the British mind you. This is freedom from the Soviet Union’s Red Army in an alternate post-WWII world with the USSR dropped the first atomic bomb on Berlin. The game in mind is none other than EA and IO Interactive’s third-person shooter Freedom Fighters. 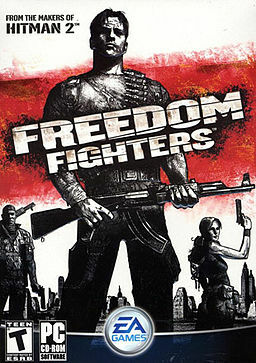 Freedom Fighters first came out in the tail end of 2003 for the GameCube, PlayStation 2, Xbox, and Windows PC. The player character is Christopher Stone, a simple plumber living in New York who refused to believe that a Soviet invasion was imminent. He is able to escape the invasion on the very first day and hides underground beneath the city of New York. He meets the American resistance force and joins up with them to fight off their Soviet oppressors. 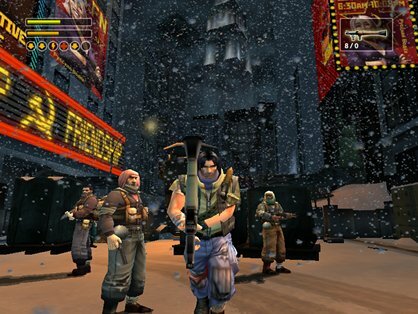 As mentioned before, the game is a third-person shooter that takes place entirely in New York. You fight a seemingly endless army of Soviet forces during your quest for freedom with a wide array of weapons. The weapons at your disposal are classic shooter fare like shotguns, machine guns such as the AK-47, Molotov cocktails, and pistols. Since you’re a plumber, you also have a powerful monkey wrench always on your person. Each level has a specific goal such as capturing a base or destroying vital enemy supplies. The game also boasts a charisma meter that is directly connected to your squad that you can grow. The higher your charisma, the more people you can recruit, which includes injured Soviet soldiers left for dead and other freedom fighters without a leader. You can command your recruits to do anything in the field of battle, such as attacking enemies or defending your base. There is also a multiplayer feature that is focused on capturing bases and controlling your squad. The two sides you can play on are naturally the American freedom fighters or the Soviet incursion. Outside of the allegiance, both are more or less the same with the same equipment and strategy. The charisma meter makes an appearance in multiplayer as well. You can have up to four players in a single round, each with your own squad, and you can play on a choice of three levels. The PC version doesn’t have a multiplayer option unfortunately, but the three consoles feature it. This was squad based multiplayer heavily focused on capturing bases that came before hit games like Star Wars: Battlefront and Call of Duty 4: Modern Warfare. Freedom Fighters didn’t have an online multiplayer option however as it came before online gaming on consoles was commonplace. 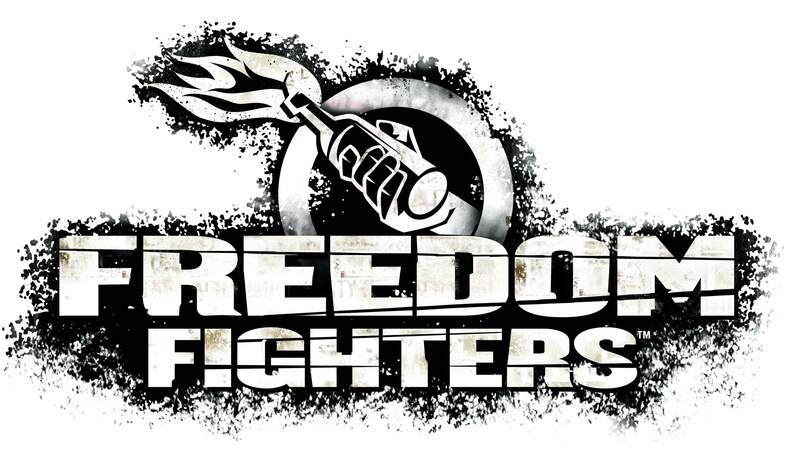 Freedom Fighters received relatively positive reviews upon release. 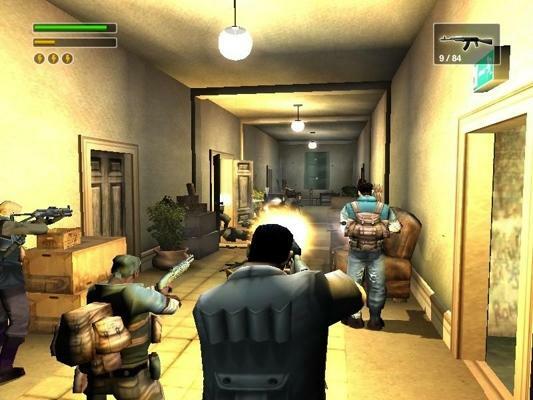 Many critics praised the gameplay and the game’s heavy focus on creating a powerful squad. It was, from start to finish, viewed as a very fun ride. However, points of criticism were some of the underdeveloped cutscenes and the fact that the multiplayer feature was definitely lacking in options. Playing in a squad was fun but with only three stages to choose, the fun can only last so long. Despite the overall positive reviews for the game, Freedom Fighters ended up being a relatively quiet title. Not many people took a chance with it, and once other games came out with similar styles but boasting titles to established franchises, Freedom Fighters was swept under the rug. It obviously didn’t help that the multiplayer was definitely lacking as well. This is a game that would’ve benefited greatly from an online option with some more choices. Despite my high enjoyment of this underappreciated title, I never actually owned it. I heard through the grapevine how great of a game it was and I turned to a close friend of mine to actually give it a shot. I had no idea how the game was received critically at the time, and I don’t recall seeing a lot of publicity for it, so I wasn’t initially willing to drop money on a game I never even heard much about. Borrowing it from my friend was a great idea as I really enjoyed my time with this game. I loved the story of trying to liberate New York and helping wounded soldiers join your cause for freedom. I distinctly remember cheering on the freedom army as I watched the resistance movement march across the frozen waters to reach the Soviet leaders on Governor’s Island. It’s an event that I have not forgotten to this day. The multiplayer was frequently a go to source for entertainment with me and my friend as well. We both love Freedom Fighters and any chance to play more of it was always welcomed. Many people have been clamoring for a Freedom Fighters II for almost a decade now, but there has been little news on that front over the years. Freedom Fighters ended with the perfect set up for a future series as well. All you did over the course of the game is liberate New York, not the United States as a whole, which is a fact that your character Chris dwells on at the end. While every solider is celebrating with fireworks and immense Patriotism, Chris AKA “The Freedom Phantom” is mourning the loss of his family and his past life. He declares that the Soviet army will return with more guns and more soldiers, meaning that their fight for American Independence is no where near over. Despite this, EA and IO Interactive have yet to build up this excellent source material to create a truly fun franchise that a lot of people can get behind. Freedom Fighters II is definitely high on my list of sequels that I desperately want to happen, and hopefully it will with gorgeous new graphics and a robust online feature. Freedom Fighters is one massively underappreciated game. It’s a gem that unfortunately never broke into the mainstream. Despite this, those who had the luck of playing this game in the past are members of a solid community of fans. These are fans that can’t help but remember the game with fondness and greatly desire a new game to revitalize this potential franchise. I’m confident that if EA and IO Interactive announced that a sequel was coming, a large number of people would line up to buy the game on release day. Interest was expressed years ago for a sequel but no one decided to make that final push to actually make it happen. Whether or not it will actually come remains to be seen, but perhaps this upcoming eighth generation is when Freedom Fighters will make a roaring reappearance. Until that happens, all we have is a decade old game and fond memories of really fun under the radar title that just bleeds American Patriotism and perfectly embodies the fight for independence.